Located on the western coast of India, Goa is the smallest state in India. Goa had a strong Portugal hold back in the day, and the influences of the same can still be seen in the art, structure and the way of being. The infusion of the Indian and Portugal cultures has given this place a unique twist and attracted people from all over the world. Many people know Goa as the party capital of India, but it is also a shopper’s paradise. The number of flea markets and the variety of shopping that Goa has to offer is hardly seen in any other part of India. Shopping in Goa is not just an activity but an immaculate wholesome experience which should not be missed. One of the best night markets in Goa, this vivacious market is active from November to April. It is exactly like the one you see in the movies where love birds stroll through colorful markets at night. This bazaar is known to serve scrumptious meals, eco-friendly items and a never-ending range of beautiful handicrafts thus making it a perfect place to pick up souvenirs and gifts for your loved ones. However, the twist is that in addition to all the shopping and food, it is totally lit at night. 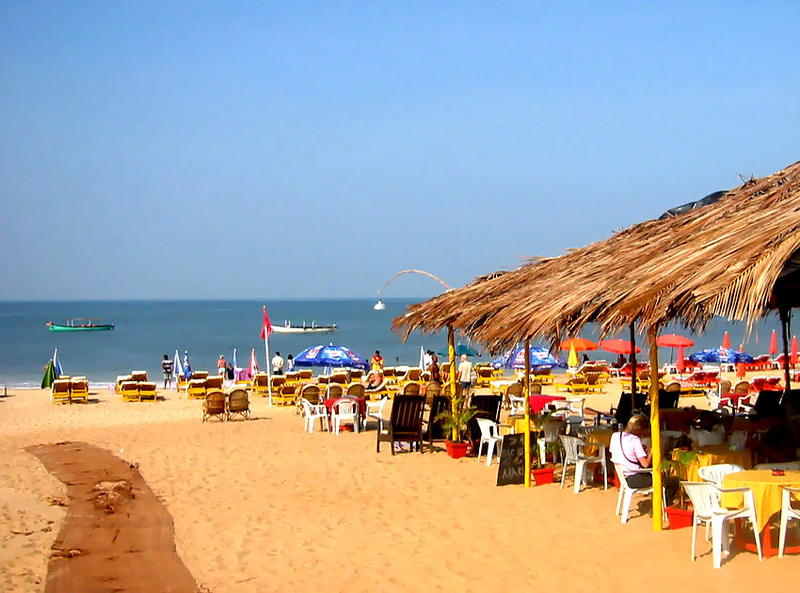 Located in Baga Beach, it has the most happening nightlife in all of Goa. Mackies’ Night Bazaar is definitely an attraction you wouldn’t want to miss. Mapusa market is by far the most famous market of Goa and has always been known as the oldest place for trade in Goa. It houses everything, right from souvenirs, antiques, pottery, pickles, fresh fruits and vegetables to lip-smacking Goan food and freshly baked delicacies. There is also a wide variety of local hand printed scarfs and clothes. This market should not be missed if you are in Goa to soak in the true Goan culture. Calangute literally translated means fisherman’s’ land and has a highly commercialized beach. The beach, situated 9 kilometres from the Goan capital, is famous for the long array of stalls, shops and the heavenly food. The market offers jewellery, textiles, sarongs, trinkets and sandals. In the central part of Calangute Market is a wonderfull Tibetan market that offers beautifully cut gems, jewellery, wooden Buddha statutes and intricately worked silver ware. It is essential to learn the art of bargaining when in the Calangute Market as the items are generally overpriced as compared to the rest of Goa. 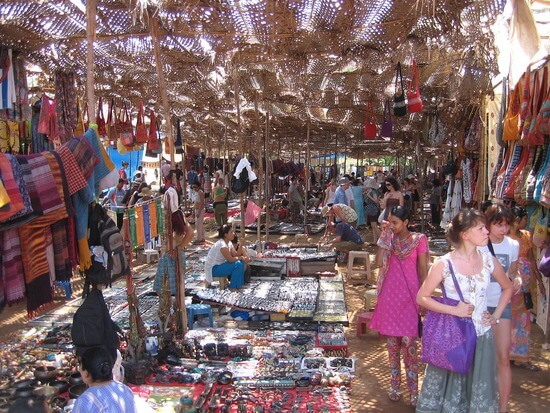 The most happening flea market of all, Anjuna Market takes place every Wednesday. This market was started by hippies three decades ago who sat drinking chilled beer, comparing their experiences and selling their jeans or handmade sea shell jewellery to raise money for their stay and food. From that day to today it has become far more mainstream and commercial with wide variety of colorful T-shirts from Gujarat; rich saris, bags and bedspreads from Rajasthan; spices from Kerala and tribal jewellery from Karnataka. The market extends up to the paddy fields behind making it a long walk and expanding the number of options. There are also a few hip bars and pubs along with kulhad chai stalls which ensure you get a wholesome experience when you spend your day here. Panjim market is the main market for the locals of Goa. Tourists crave going to this market due to the huge number of restaurants to choose from. Apart from this, you can find just about anything and everything here. Dried and fresh fish, spices, homemade pickles, fruits, vegetables, Goa’s famous ‘chouricos’ sausages, textiles, clothing, coir mats and the famous cahew nuts, this is the one stop shop for everything you would want from Goa. The markets of Goa can get repetitive but not this one. This colorful market sells the rarest of rare handicrafts and artifacts sold by dealers at reasonable prices. A night market, it looks magnificent in the moon light with its vibrant colours standing out and creating a beautiful hippy like atmosphere. This market sees a lot of foreign footfall owing to its unique products and antique nature.